For 10,000 lb. 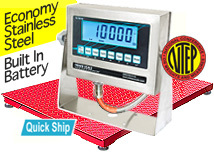 floor scales with industrial strength and durability, FloorScalesDirect.com is the right place. 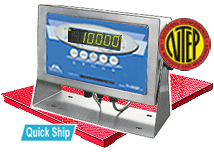 Our floor scales for sale packages are the best way to purchase an entire system that is calibrated for easy setup and the highest accuracy. Self-leveling weighing decks are built with diamond plating surface, shock absorbing feet, and a steel junction box. 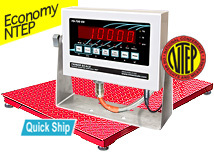 Our industrial floor scales ship with full-feature digital indicators certified by NTEP and are optimized for high visibility with LED display. Our rectangular deck floor scales are designed to function outdoors, indoors, or in hostile environments and their overload protection feature prevents equipment damage. Our 10,000 lb. 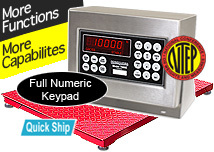 industrial floor scales are ideal for warehouse shipping and receiving. Take advantage of free shipping throughout most of the continental United States, and ship your order by the following business day with our “Quick Ship” option. For the best 10,000 lb. rectangular floor scales industrial packages, shop FloorScalesDirect.com today.